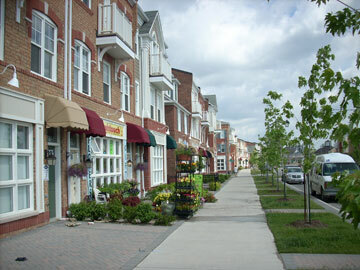 to walk around the Cornell area of Markham. Many of the shots were taken during the annual Cornell Garage Sale. Households dotted all around Cornell take the opportunity to divest themselves of items they no longer need, and bargain hunters roam the area looking for things to complement their own homes. Some shots feature the rows of shops to be found on Bur Oak Avenue, and yet others illustrate some of the special features found in Cornell. All garages are located at the rear of the houses in laneways. With the many beautiful gardens and terraced fronts to the houses, it is always pleasant to walk this unique place. Interested in renting in Cornell? Need a place while awaiting completion of a new home? Cornell is located on the East side of Markham, to the NE of Toronto. It is bounded by 9th Line to the West, 407 to the South and Don Cousens Parkway to the North and East. A features map of Cornell can be seen at SayItCornell.com.